in the mob ... he is the mob! And no one knows this better than Johnny Magee. The Caruso family destroyed his dad. Now, it's payback time -- and he's going to need an unsuspecting insider ... one who won't realize what he's really after. Tea loves her family but hates what they do. She's tried to stay far away from her notorious relatives, making a legit name for herself as an interior designer. But her grandfather Cosimo's gala 80th birthday is coming up. Every mobbed-up member of the family from San Francisco to Sarasota will be there -- and it's time for Tea to face the family or face the consequences. 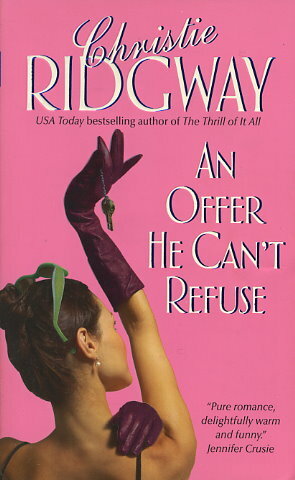 Intent on using Tea for revenge, Johnny hires her to redo his home, but then she makes him "offers" he can't refuse. Soon he's falling in love with the enemy and when all the secrets are revealed, what will Tea do ... and even worse, what will her family?